William Morrow Paperbacks, 9780062015716, 368pp. Already deservedly lauded for the superb historical crime novels featuring shell-shocked Scotland Yard inspector Ian Rutledge (A Lonely Death, A Pale Horse et al), acclaimed author Charles Todd upped the ante by introducing readers to a wonderful new series protagonist, World War One battlefield nurse Bess Crawford. Featured for a third time in A Bitter Truth, Bess reaches out to help an abused and frightened young woman, only to discover that no good deed ever goes unpunished when the good Samaritan nurse finds herself falsely accused of murder. 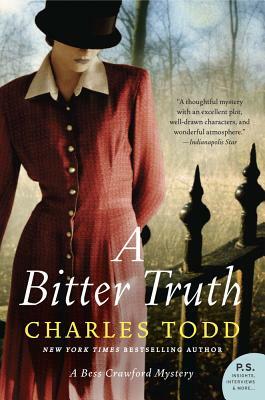 A terrific follow up to Todd’s A Duty to the Dead and An Impartial Witness, A Bitter Truth is another thrilling and evocative mystery from “one of the most respected writers in the genre” (Denver Post) and a treat for fans of Elizabeth George, Anne Perry, Martha Grimes, and Jacqueline Winspear.